This designated recreation area in the 6,908,540 acre Chugach National Forest is one of the Kenai Peninsula’s most prized outdoor winter destination spots. The unlimited amount of activities coupled with the towering mountain views is like something straight off the front of a postcard. There is no doubt that upon arrival you’ll have to pinch yourself in disbelief of where you actually are. It’s truly that incredible. The natural beauty that you’ll find here has a way of shooting right into your soul and making you fall in love with Alaska’s Playground on a whole new, overwhelmingly powerful level. The Turngain Pass is located just over an hour south of Anchorage off the Seward Highway, or about that same distance north of Kenai Peninsula towns such as Seward and Soldotna. On a sunny, clear day the drive to get to Turnagain Pass in the wintertime is like a vacation in itself – absolutely enchanting every step of the way! But it can get very slick due to inclimate weather conditions, so be sure to drive with extreme caution. If you are someone who wants needs to fuel your need for speed during the snowy winter months, the Turnagain Pass is exactly where you need to be. Adrenaline junkies will feel right at home in this massive, wildly remote paradise. To see exactly what we’re talking about, check out the YouTube video below to see just how epic the riding is in this stunningly beautiful territory. On the other side of the pass where motors aren’t allowed, you can enjoy getting deep into the backcountry via snowshoe, cross country skis or snowboard. The endless mountain views coupled with the pristine silence that surrounds you is positively breathtaking. We are willing to bet that you will never, ever want to leave. 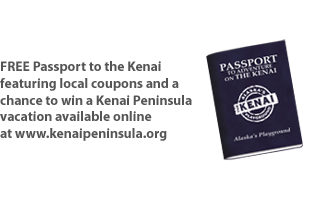 This is real, raw, rugged Alaska at it’s finest – and it’s right here on The Kenai, Alaska’s Playground! For an awesome up close and personal look into the magic that is skiing in Turnagain Pass, check out the awesome YouTube video below and prepare to ‘get a good feeling’ that will leave you itching to get outside and play in the powder! If you’re lucky and find yourself enjoying Turnagain Pass on a clear winter night, you might even have a shot at seeing the bright lights of the Aurora Borealis dance above you. To see just how mesmerizing it can be, check out the epic footage below featured on YouTube by Alaska Dispatch News. This will give you the chills, it’s truly that beautiful. Now that you’ve completely fallen in love (just like we have) with the strikingly appealing Turnagain Pass, let’s all start doing our snow dances and hope that we get a flurry filled winter season. If you need any more tips or travel recommendations this winter, never hesitate to reach out to us – we are happy to help you have fun on The Kenai!